**Coaches/Fans send results in! We will update this post! It only takes a pic! 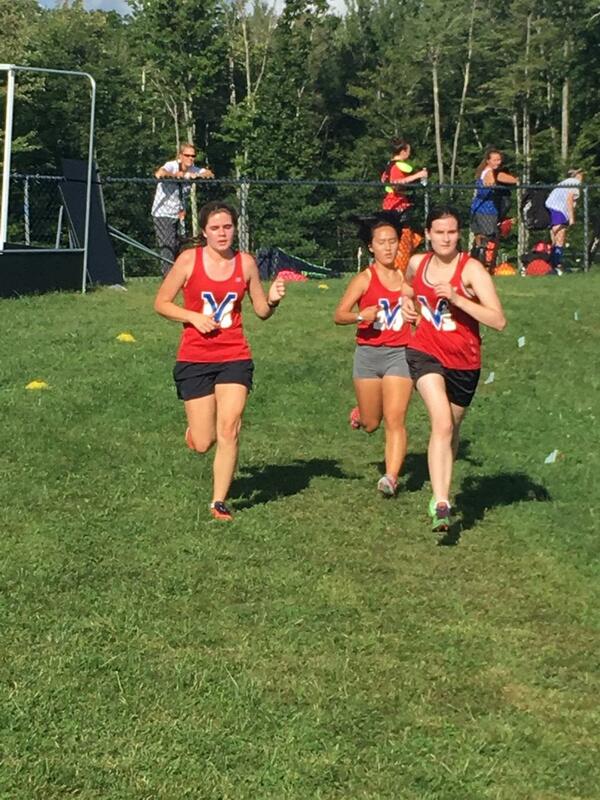 Results Link to LancerTiming – recap, race videos, interviews, pics coming soon! With a summer full of rain and plenty more this past week to dampen the course, Mother Nature did her best to slow down the competitors at Mascenic’s Homecoming race. 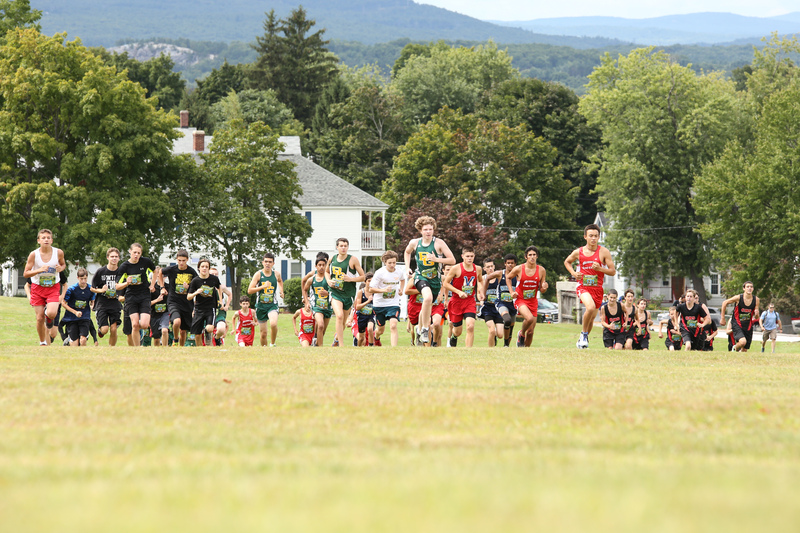 With visiting teams, Bishop Brady, the Derryfield School, Hinsdale, Conant and Hillsboro Deering all in attendance, the athletes were looking to turn and burn on the historically quick Mascenic course. With the course records set at 16:24 and 19:39 (both 2014) by former Mascenic champions Tim Fafard and Elizabeth McGurk, the question would be could those times be challenged. The answer to that question would be no. With four days of rain this past week, the course was not only soft but had standing water in places at race time. But while the times wouldn’t be hot, the competition was, and in full view for those spectators looking to kick off the Homecoming weekend. The meet got underway with the girls race, promptly at 4pm, when from the gun, Hinsdale’s Margaret St. John (#5 at D3’s last year) and Mascenic’s sophomore-on-the-rise Quinn Aldrich went right to the front, pulling Conant’s Isabella Mormando along with them. Strung out behind the lead group was Mascenic’s Sophie Callahan, a slight gap back to the rest of the racers by the rest of the Mascenic girls squad. Half a mile in, St. John and Aldrich were shoulder to shoulder with Mormando trailing behind them and Callahan giving chase. Mascenic’s 3-4-5 were working together to try to drop the rest of the field and had moved into the top ten. This would be the order through the half. As the top two re-entered the start/finish area for the second lap, Aldrich and St. John set about testing each other with little surges but neither could get away. The soft ground stealing energy with every step. In the end with half a mile to go, St. John built a slight gap and would go on to finish first, in 21 minutes, 41 seconds, with Aldrich 9 seconds in arrears. Mormando would hold off Callahan for third and Derryfield’s Hardy would finish in the fifth position. But the story of the team race would be told in places 6 – 10. The Derryfield squad would make inroads on Mascenic’s 3-4-5, splitting them to seventh, tenth and eleventh; however, the Mascenic girls would snag sixth, eighth and ninth to win this one handily over Derryfield, 24 to 44. Conant would finish third with 52 points. By the time the boys got rolling, with the tenor of race set by the Lady Vikings, the boys were looking to rock and roll as well. 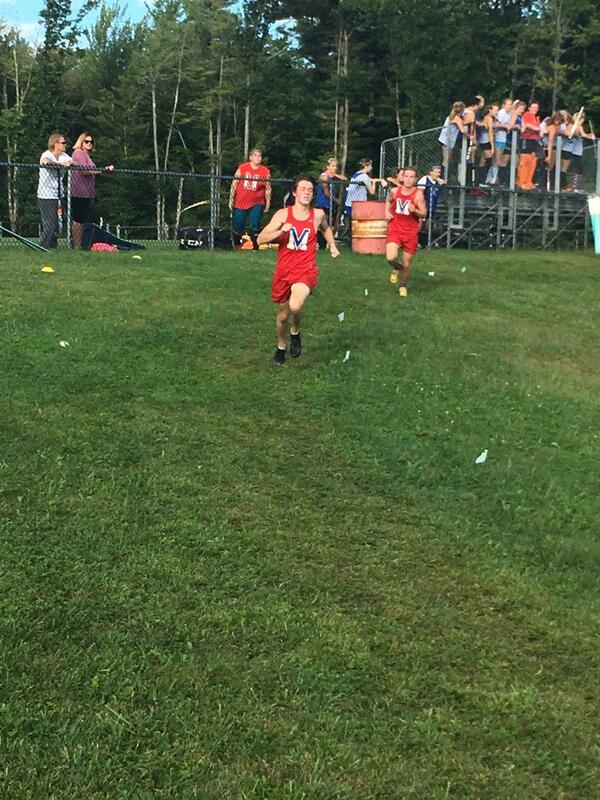 Once the gun fired, Dakota Somero went right to the front, leading teammates Logan Thibault and Landen Vaillancourt . In jockeying for early position, Thibault nearly went down, gorilla crawling ten meters before regaining his footing and stepping on the gas to get clear. That effort to stay upright might come into play later in the race. Thousand meters in, Mascenic occupied the top four spots and six of the top ten while appeared to be driving hard. At this point, Vaillancourt was at the front, gapping his teammates as they headed to the mile mark. The gap grew to 20 meters over the first lap, with six of the top ten spots occupied by the host team. Conant’s Chris Taylor and Matt Bernier were gamely hanging on as they entered the start/finish area for the second lap. Over the second lap Thibault worked on closing the gap to Vaillancourt and by two miles the two were running shoulder to shoulder up front, well ahead of the chase pack. Hitting the gas on the second lap was Mascenic’s Robert McLain, sitting in sixth at the end of the first lap he moved into fourth by two miles and was closing the gap to Somero. With 400 meters to go, Thibault and Vaillancourt attacked the final field hockey hill in lock step when Thibault went to make the pass. Vaillancourt had enough left to crank it up one more time and the duo finished that way, with both runners dipping under the 17 minute mark, running 16 minutes, 54 seconds and 16 minutes, 56 seconds. McLain would continue his march, moving into third by 2.5 miles, holding off Somero in the stretch. Fifth in would be Conant’s Bernier, spoiling the perfect score for Mascenic. Bernier was followed closely by Mascenic’s Connor Traffie as the sixth finisher and Mascenic’s fifth scorer. Conant’s Taylor would be in next, followed by Brady’s Tierney, Mascenic’s Movsessian and Brady’s Spenser to round out the top ten. With five in the top six, Mascenic would win this one handily, scoring 16 points with Conant in second with 63 points, and Bishop Brady in third with 84 points. Previous post 2018 Bobcat Invitational Recap, Results, Interviews! 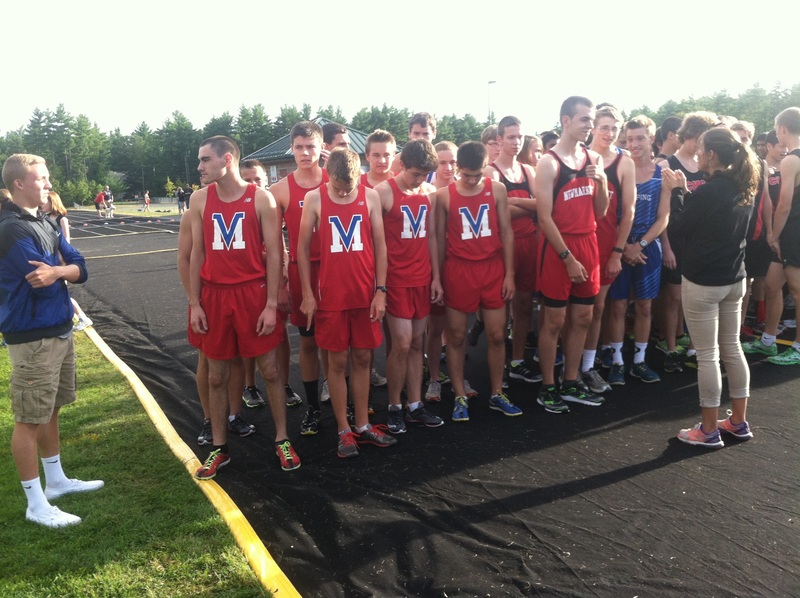 Next post Nashua Invitational Recap, Results, Pics! Updated with Races and Interviews!